Eric Ruhlman Thank you Dan and the rest of the crew, had a great time in Maine ! Awesome guide and great meals clean rooms and beautiful country ! I will be back for sure. Thank you Maine Trophy Outfitters. Erich Knox- Dan works hard to get everyone an opportunity for big bear....which are plentiful. The food is plentiful as well: the camp is spacious and functional with a relaxed, friendly atmosphere. Great experience. Brad Cullivan — "Dan is the best that there is. We had a great time, enjoyed great company, and best of all, my son harvested his first Maine Black Bear, on his 10th birthday !! It was a bruin, weighing in at 308 lbs ! Dan helped in every way possible. 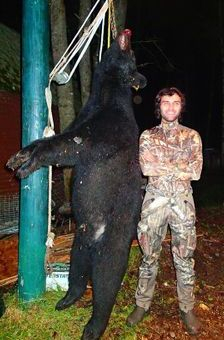 If not for Dan and Molly (one of his many awesome hounds) we would have never recovered this bear. Thank you Dan and Ashley for a great time and unforgettable memories !! Top notch !" Some would ask if this hunt was worth the 3200 mile drive. In a word, yes. Dan thank you and your wonderful support staff for all of your hard work. In Kentucky tonight there are two tired but very happy old farts. Because of you we were able to take a bear by the second most pure form of hunting. Thank you for sharing the incredible sun rises, the grouse, the moose, even the one that got a bit to close for comfort. Thank you for the wild truck rides. And the dogs, God bless 'em all. They work their hearts out for us and were worth the drive up there just to see them work. You guys have a hard life and I wish I were half as tough as you were. God willing, Ed and I will return to hunt again with you. Dan, I just wanted to take the time to say thank you again!!! You obviously turned a 25 yr. bait hunter into a hound hunter and that's saying something!!! You are a straight up no bull guide and I knew it from the get go and I think you figured me out pretty quickly too. Like I said to you in the truck on Sat. night this was hands down my best bear hunt ever!!!! And I've been on lots of them in U.S. and Canada. You and your team of guides have gained my respect and I respect you personally for listening to my advice to make your operation run more smoothly!!! I cannot wait till next year good luck the rest of the season and keep in touch!!!! 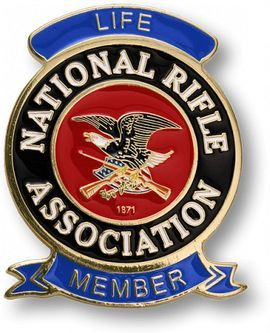 Rick Goodwin Thank You! I AM 100% sure that Mr. White Blaze would not have been bagged without the skill of you and your team. Hurry up next year!!!!! You are the best outfitter our family has ever had the honor of hunting with! We appreciated the effort you and your guides put forth, you guys are awesome and we really enjoyed making friends with the other hunters, especially Rick he's a riot. Thank you for your long hours, dedication, patience, tact, skills, humor, insight & views, you all work flawlessly and hard. Looking forward to next year! The following is a brief personal recommendation in favor of Registered Maine Guide, Dan Wagner of Allagash, ME. I was fortunate enough to draw a Bull Moose Permit for the October hunt in Maine this year. 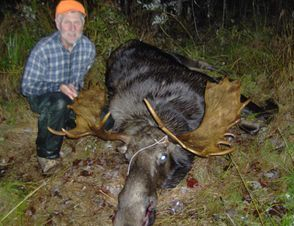 Never having hunted for moose, I began looking for a guide who had both experience with moose and knowledge of this area in Maine, I hired Dan to help me out. The hunt became successful on day #4 of the hunt. I took a 750 lb Bull (dressed), with 20 points and a spread of 48-1/2”. I shot the moose at 5:55PM and we had it in his truck at 10:00PM. * Personally, I would recommend a “one-on-one” hunt with Dan, ie No Sub-Permittee (I believe you will get the most out of your hunt). This was truly a “Hunt of a Lifetime” for me, and I give Dan all the credit for making it both successful and memorable. Overall, I firmly believe that you will enjoy your hunt with him. Feel free to either call or email me to discuss further if you wish:"
Israel Schultz — "Best guide hands down. He is what you can ask for. Hunter first, guide second!!!" Kent Roberts — "Dan will definitely put in the work to put bears in front of you. Great outfitter and he knows his bears. I hope to hunt with MTO again soon." David Schultz — "Great guide and person to be around. 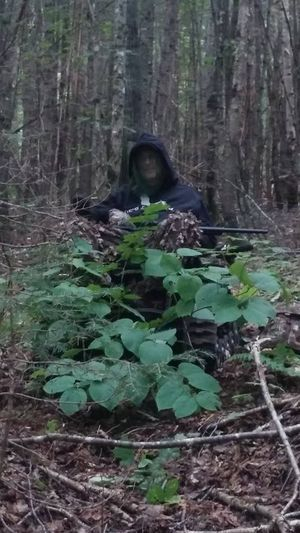 I would tell anyone who was looking for a great time and hunt or trap to call Dan." I met Dan Wagner and Mark at an outdoor show. After talking with them I booked a hunt because mostly they seemed like good, honest hard working regular people. I had a great week in camp. Dan did what he promised, worked hard to get me on some bears and he was a pleasure to hang with. BTW, I'm paralyzed and live life in a wheelchair. Didn't phase Dan any. He treated me like any other hunter and made sure his accommodations fit my needs. Dan is the real deal. I'll hunt with him again. My only criticism is with Ashley. She is way too good a cook and prepares way too much food. I'm a weak person and can't resist her home made bread, apple crisp, Angel food cake, strawberries and on and on. I've NEVER eaten this well in my life! (I only say that because my wife won't ever see this). 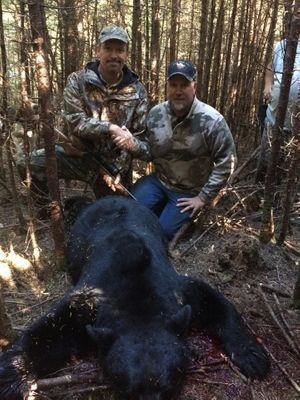 If you want to have a good hunt, good eats and good friendly talk, give Maine Trophy Outfitters a try. Travis Bryand — 5 stars! !